Home Blog How To GPUs What is a GPU stress test, and which ones are best? What is a GPU stress test, and which ones are best? Here at WePC, we’re dedicated to making sure all of your questions about GPUs are answered. On some days, we focus on big questions, like “what is the best graphics card of 2019?”...and on others, like today, we focus on stress tests. Today, we’re going to explain what they are, why you need them, which ones to use, and how to run one yourself. Before the end of this article, we’re hoping that all of your pressing questions are answered, but you’re welcome to leave a comment below if any questions still linger! What is a GPU Stress Test? A GPU stress test is an application used to push your GPU to its absolute limits. This means full utilization of its processing power, using all the electrical power available to the card, all while pushing the cooling and the temperatures as far as they can go. In most cases, practical applications (like games, even high-end games), won’t serve as stress tests, because even if they do push your GPU’s limitations, they aren’t going to do so to the point where you risk crashing or overheating your system. Stress tests, on the other hand, are actually built with the goal of causing crashing or overheating. Or, more accurately, to ensure that there is no way that the component in question will do that during normal or intensive usage. That’s why it’s a test and the only way to pass is for the component in question-- the GPU in this scenario-- to keep running without issue. These tests are particularly useful for those trying to find a stable overclock (that’s why you’ll sometimes hear it called a graphics card stability test) or for various troubleshooting problems you might come across when upgrading components and the such. How Can I stress Test the Rest of my PC? That being said, the GPU isn’t the only component that is stress-tested. Other common candidates for stress testing include the CPU and the RAM. If you want to give your CPU a stress test, we recommend using an application like Prime95 or Aida64. RAM, meanwhile, is best tested with Memtest86, which is ideal for diagnosing RAM problems. If you’re interested in using these applications for stress testing, let us know and we may make some dedicated tutorials for them down the line! For the scope of this article, however, we’re going to be focusing on stress testing the GPU and teaching you everything you need to know about doing so. 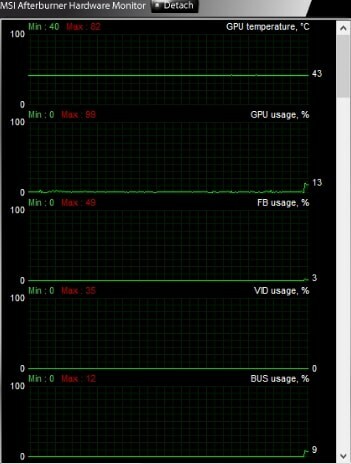 How to monitor my GPU during a stress test? Ideally, you should be using your overclocking application of choice to monitor your temps while you’re running a stress test. If you aren’t familiar with GPU overclocking and don’t know what to use, simply head over to our GPU overclocking tutorial or install MSI Afterburner for monitoring purposes. In Afterburner, you’re going to want to watch the right window, which will provide active readings for your GPU. 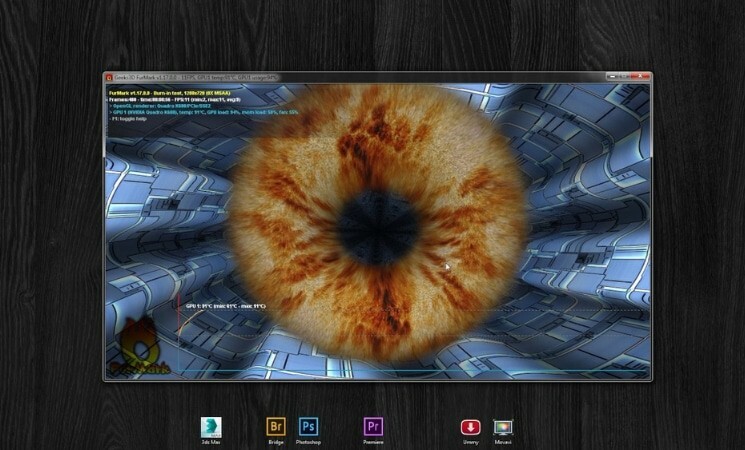 Embedded above is an image of my own Afterburner window with my GPU running at idle. You typically only need to worry about two readings here: GPU temperature and GPU usage. During a stress test, you should expect temperatures to go as high as 90°C (194°F), with GPU usage spiking to 100%. Don’t be surprised or concerned at either of these numbers. If your GPU goes over 90°C, however, and especially if it breaches 100°C or higher, be cautious. You may be overheating your GPU past its limits, and doing this for an extended amount of time may damage your GPU. If you notice your temps are too high, that’s a good sign to either boost your fan speeds or turn down your GPU clocks. Particularly aged GPUs may need active underclocking to prevent overheating and to maintain stability, but this is generally a worst-case scenario. With your monitoring/overclocking software installed, it’s time to talk about stress tests. Today, we’re going to give you the three best GPU stress tests. Whether you need to GPU stress test Nvidia GPUs or AMD GPUs, you can use just one of these, all of these, or any combination therein. If you choose to use only one, however, we recommend FurMark. FurMark is a free OpenGL benchmark/stress test, and for the past five years it has reigned supreme in the enthusiast’s arena. Thanks to continuous updates for the latest GPUs, an easy-to-use interface, and the unparalleled ability to weed out instabilities and push GPUs to their limits, FurMark has remained relevant since its release. If you’re only going to run one of these stress tests, we recommend using FurMark. It’s been the top choice of the enthusiast community for a long time now, and it’s completely free. However, we only recommend using it for our Basic or Great Stability tests. If you plan to run a longer, more extensive performance and stability test, use one of the Unigine demos. If you want a free GPU stress test for more real-world scenarios (that’s also much prettier to look at), Unigine Heaven is a good place to start. Despite having celebrated its ninth birthday, this benchmark is still a favorite, as a standard with which to compare current-gen GPUs to previous-gen GPUs, as a tool for checking stability, and just a fun little benchmarking tool. While most of Unigine Heaven’s features are completely free, you will need to spend a little if you want to make use of features like automated benchmark looping, which is useful for extended stress test scenarios. If you want something even more intensive (and built from the ground up for cutting-edge GPUs), you can try Unigine’s other stress testing software: Superposition. Unigine Superposition may not be quite as (aesthetically) pretty as Unigine Heaven, but it’s much more technically demanding. Superposition tests all kinds of advanced lighting and shading features; in fact, it’s built to bring even the likes of the GTX 1080 Ti to its knees. If you’re using an older or mid-range GPU, however, you’ll probably get more meaningful results out of one of the previous two tests that we’ve recommended. Like with Heaven, Superposition is free-to-use, but automated looping for stress test purposes and VR testing are both locked behind a $20 paywall (which isn’t bad if you’ve already spent hundreds on a VR setup). You can still use the free version for stress testing, but you’ll want to keep it for shorter stress tests or come back occasionally to re-run the benchmark. Once you’ve decided on which of these three you want to use and have installed them, continue to the next section. How To Test My Graphics Card? Now that you know what stress tests are and which ones to use, it’s time to teach you how to actually run a graphics card test. Note: While we wouldn’t expect that any damage comes about to your system during these tests, it is possible. As such, we are not responsible for any damage you may do to your system while using these tests! First up, go ahead and set your overclock of choice. If you aren’t overclocking and just testing your GPU’s performance or stability, then just skip this step. If you want to overclock but haven’t started yet, head over to our GPU overclocking guide to get started there. If you’re continuing from here, we’re going to assume that you’re either testing an overclock or your system’s stability at stock clocks. Close everything. If you need to use your PC during the stress test and simply don’t have time to spare away from it, a lightweight browser like Opera may be okay, but stay away from tasks that are going to add GPU usage, like watching a video on YouTube or Netflix. You should avoid any kind of visual media consumption while you’re doing stress tests or benchmarks of any kind, as you run the risk of muddying up your results or, in extreme cases, crashing your system. At this point, all that should be open on your desktop is your overclocking/monitoring software. Now, open up your stress test application, and click run! You may feel tempted to mess with different settings, like resolution, fullscreen, graphics presets, etc...you can do this if you like, but it isn’t necessary for running tests like these. Your GPU should still hit 100% usage and your temps should go as high as they ever will, regardless of any options you may choose. In short, it’s really a matter of personal preference. With the Unigine applications, we’d recommend running in fullscreen at your native resolution...if only so you have something pretty to look at while your GPU is being put through its paces. Be sure to have your temperature and usage readings still accessible, though. Now, it’s time to decide how long you’ll be running your video card test for. We’re going to go over three basic ranges to start with, and why you may choose them over other options. Note: FurMark is only recommended for Basic tests- running it for longer than an hour may just end up damaging your GPU, so we recommend using the Unigine stress tests past the Basic Stability tier. This is the basic test. FurMark, Heaven, and Superposition should all crash if you have an unstable overclock or basic cooling problems with your GPU after being run for thirty minutes. If you make it past here, your system should be cleared for any kind of general usage or media consumption, with average-sized gaming sessions (1-2 hours or less) being a safe bet as well. If your system can’t pass this test, turn down your clocks, turn up your fans, and try again. If you want to ensure stability for extended gaming sessions (3-5 hours), an hour-long stress test should reveal whether or not your system can actually handle gaming sessions like that. If you make it through a Great Stability test without any crashes or severe overheating problems, consider your system clear for most gaming scenarios. If you’re a marathon gamer, marathon streamer, or often have your GPU running for extended amounts of time (for rendering, mining, etc. ), you may want to opt for a Guaranteed Stability test. This is where the auto-looping features of the paid Unigine tests will come in most handy, especially if you decide to run this test while you’re sleeping or out of the house. If your system manages to pass this test, congratulations! You should be cleared for...well, pretty much anything. Running actual games usually won’t push your GPU quite as hard as either of the Unigine tests, and an overclock that runs under heavy use for 8 hours is considered pretty darn stable. And that’s it! We hope that this GPU stress test article helped answer any questions you might have had about stress tests and how to run them. If you’re here as an overclocker, we hope we helped you bring out the best performance in your card, and if you’re here to diagnose your system...we hope you passed the test (or figured out the issue)! If you have any lingering questions or issues, feel free to sound off in the comments below and we’ll do our best to help you.